Like I mentioned a few posts ago, I recently took on a full-time job (the hours are flexible, but I kind of have been always working if I’m not sleeping) and I usually leave for work very early in the morning since traffic here is kind of ridiculous. I end up having to put my makeup on in the car—a skill that I feel very much proud of. I usually take along two bags: one with all the base stuff to leave in the car and one with all the things I want to keep with me for emergency touch-ups, though I’m usually too lazy to touch up at all, to be honest. Sun protection comes in the form of the Bioré Aqua Rich Whitening Essence* which I love to pieces. I usually already moisturize before leaving the house so that I don’t have to bring around a bottle of oil or anything extra along with me. For my base, I definitely always use a primer always, my favorite being the Hourglass Veil Mineral Primer. I sometimes go for the Glossier Perfecting Skin Tint (Medium), but if I’m too lazy, I just go in with the NARS Radiant Creamy Concealer (Ginger). 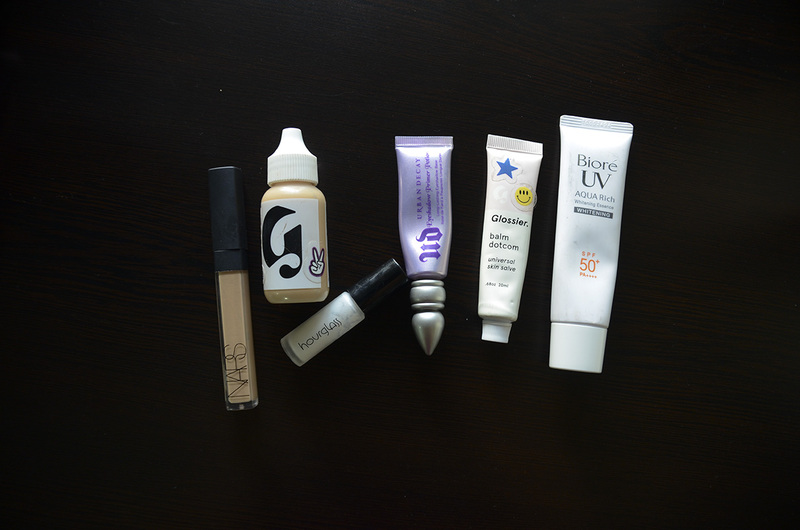 Eye primer is Urban Decay Primer Potion, which is still my holy grail, and lips are often prepped with the Glossier Balm Dot Com (I know, I want to let that name die, too) though I find that it makes my lips too shiny, so I have to wipe it off, usually if I want to wear a matte lip or something. I’ve been playing around with lip colors lately, since that’s the easiest, so I’ve been almost exclusively been using the NARS And God Created the Woman palette—most especially Alhambra all over the lids, buffed out with Galapagos in the outer corner. Sometimes I use the soft brown/beige color and the warm brown in the shu uemura x Karl Lagerfeld palette (Prestigious Bordeaux is what it’s called, if I’m not mistaken?) but I usually just stick with the NARS palette. It’s not pictured but aside from a handful of times, I mainly use a K-Palette liquid liner. 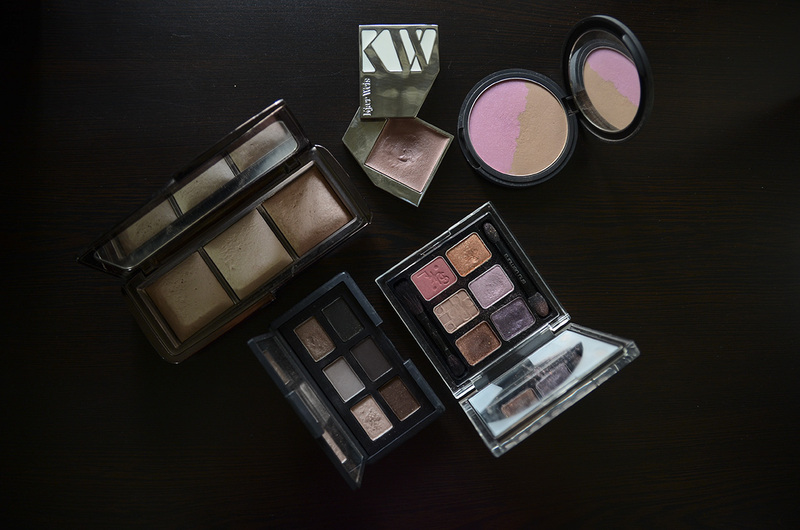 Cheeks, I mainly use the Hourglass Ambient Lighting Powder in Radiant Light, but if I’m feeling cheeky like putting in a bit more effort, I also like using the Le Métier de Beauté Blushing Bronze Duet (Romeo and Juliet) or the Kjaer Weis Cream Blush in Abundance. Makeup (concealer, face stuff) is set with the Hourglass Ambient Lighting Powder in Dim Light, and if I’m feeling like I want to glow a little bit, I use a tiny bit of the Hourglass Ambient Lighting Powder in Incandescent Light on the tops of my cheekbones. …And that’s mostly it! The lip color I find that I gravitate towards the most is the NARS Pure Matte Lipstick in Tonkin. It’s just an easy color. I’ve been wearing tons of other shades, though. MAKE’s Silk Cream Lipstick in Deep Flesh (which I have in the Aether Palette*) is a particularly nice rediscovery. In car makeup application? Now that’s an art! Hope you pack some little makeup wipes for the hands, I know how many times I was my hands off in the morning putting on bases!